Like his companion piece "Abstract Autumn" we see in this tapestry an abstract scene of the season of autumn. Here in this tapestry "Modernist Autumn" we see an elegant and bold use of color with the rich reds of the leaves complementing the auburns, brown and greens in the rest of the composition. The patterns on the leaves themselves are rendered beautifully and hints at the dramatic transition from the greens through reds through to the resulting browns of the leaves. This is a representation of change and evolution that is the hallmark of this season. 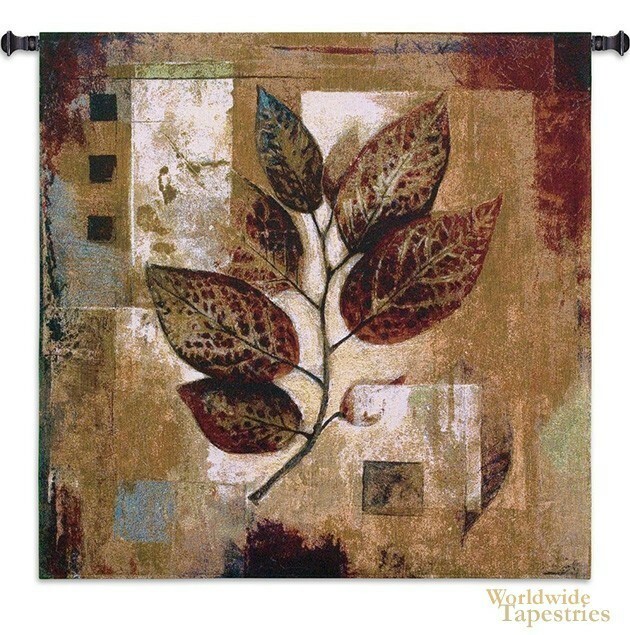 This contemporary tapestry "Modernist Autumn" is backed with a lining and has a tunnel for easy hanging. Note: tapestry rod and tassels, where pictured, are purchased separately.